We continue to count down our Top 10. Here’s what we have so far. 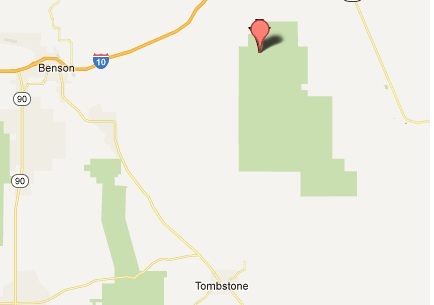 Shown is the location of the Dragoon Springs geocache. Don’t let the close proximity of I-10 fool you. This is rugged desert back country with no cell phone service and no AAA. Trying to nail down the Top 10 is sometimes elusive because as we travel around, we run into a lot of potential Top 10’s. Basically, to make the list, there has to be something extraordinary about the geocache under consideration. It might distance, difficulty, uniqueness, history or just the surroundings. Our #5 cache fell into all of these. From January 2012, welcome to the geocache at Dragoon Springs. In the high desert Chiricahua and Dragoon Mountains of southeast Arizona, a number of natural springs gurgle out from amongst the rocks. One of them was Dragoon Springs. This area was the homeland of the Apache, who didn’t take kindly to trespassers. Since water was critical, they watched and guarded the springs aggressively against interlopers from the Conquistadors to Mexican bandits. Ruins of the stage station at Dragoon Springs. This was a “swing” station which had only horses and water. “Home” stations had food, quarters and maintenance. The livestock and the workers all lived inside the big stone corral, which was 10 feet high and up to four feet wide. There was no roof. This gave protection from Indians, bandits and predators which abounded, including mountain lions, bears and wolves. The Gadsen Purchase of 1853 made the land part of the United States. White settlers, ranchers and miners began arriving in great numbers and a large military presence was also established. In the decade before the Civil War, the whites and the Apache, under Cochise and Mangas, observed an uneasy truce. In 1857, the Butterfield Overland Stageline began operation through the area on its way from St. Louis to San Francisco. They had way stations with food and fresh horses at each of the springs. One of them was Dragoon Springs. In 1861, the Apache ended the truce and started ridding their lands of whites. The Butterfield stages became prime targets, with 22 drivers killed in 16 months. The line was already in financial trouble. Apache attacks and competition from the Pony Express finished the job. It folded just after the Civil War began. 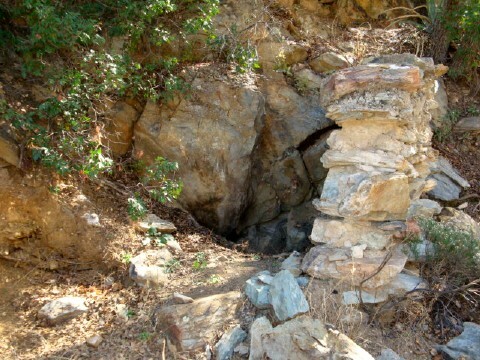 The site of the actual springs, which no longer run. They were sealed off by an earthquake in 1880. The wall was built by ranchers after the Civil War to keep cattle out. Water flowed down the wash and was channeled into tanks to water livestock. The geocache is about a quarter of a mile uphill off the top of the picture. The way stations and the route itself were the only transportation and logistics infrastructure in the entire region, so they were used by both sides in the desert war of 1862. In this little known theater of the Civil War, the Union Army, the Confederate Army and the Apache all fought each other. 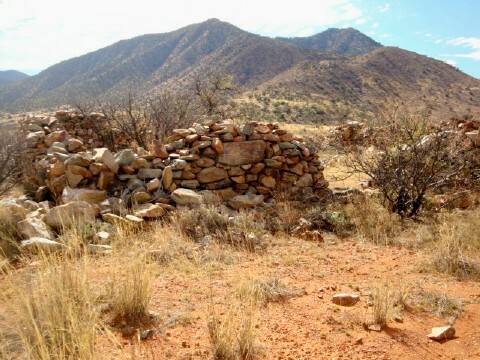 The abandoned Butterfield Stage station at Dragoon Springs was the site of two fights between Confederate cavalry and Apache war parties. On May 5, 1862, a Confederate patrol was foraging and rounding up stray cattle in the area around Dragoon Springs. They were jumped by an estimated 100 Apache at the now abandoned stage station. Four Confederate soldiers were killed and the livestock stolen. The rest of the patrol got away. 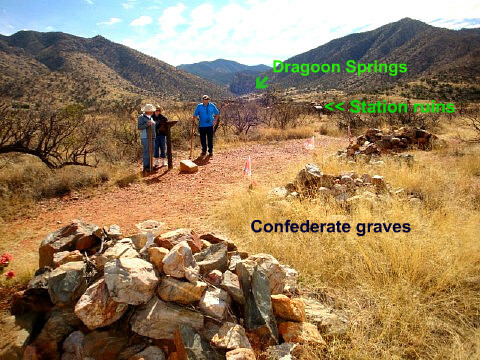 This was the First Battle of Dragoon Springs and they were the western-most combat deaths suffered by the Confederacy. Dragoon Springs Station is now a National Historic Site. Getting to it requires either a long hike or four wheeling over some of the worst terrain I’ve ever had to negotiate. It took us several hours. The site and the scenery are worth the trip. This is an overview of the whole site with a cameo appearance by Team Snowbird. Four days later, on May 9, came the Second Battle of Dragoon Springs. A larger patrol found and engaged the Apache war party in the same area, killing five and getting the livestock back. The four Confederates killed in the first battle were buried in shallow graves and covered with stones. Those graves are preserved and marked by the National Park Service along with the ruins of the relay station. 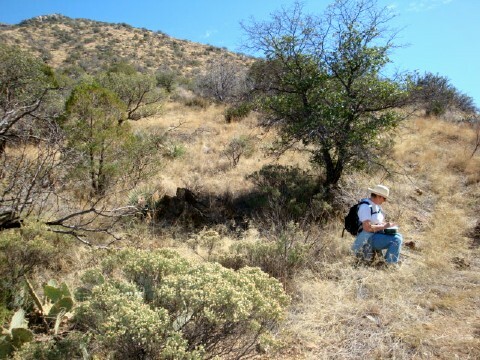 The geocache itself is a further hike from the station. We were able to drive to within 7/10 of a mile, then hiked in the rest of the way. An ATV can almost drive up to Ground Zero. The geocache itself is an easy find. Like they say, getting there is half the fun. Mission accomplished. Natasha at Ground Zero signing the log. Now it’s off to Tombstone and dinner at the Crystal Palace, which hasn’t changed much since the Earp brothers ate there. This one took us most of a day from our snowbird headquarters in Tucson. The Dragoon Mountains are spectacular and full of cool places to check out. We barely scratched the surface but are headed back in 2013. Can’t wait!